You know what! A simple Indian khichadi can be prepared very creatively. It tastes great too. 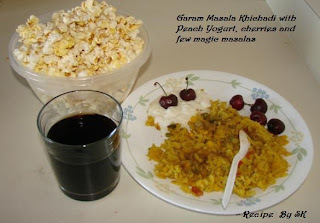 Try this below amazing fusion of masalas and khichadi and relish the taste. You need, a pressure cooker, a stirrer, cutting board, knife and regular dish for serving, serving glass for coke, a container for popcorn. 1. Chop onion, mirchi, and tomatoes separately. 2. Mix rice and daal with 2:1 proportion, wash it and keep aside. 3. Heat cooking oil directly in pressure cooker without lid and put cummin seeds once oil heats. 4. Put chopped mirchi and onion. Let fry till onion turns slight brown. 7. Once stirred properly, add salt to taste. Also add the surprise peanut (green), and corn cuts too. 8. Now add the rice and daal mix and add sufficient water. 9. Cover the lid of pressure cooker and let cook till 4-5 whistles. 10. Meanwhile prepare your dish with Peach flavored yogurt, cherries. 11. Prepare popcorn, and pour yourself chilled coke. 12. Once cooker is ready, let it settle down for 5 mins. 13. Take your special magic masala khichadi in dish. 14. Sprinkle chaat masala to taste. 15. Take peach flavored yoghurt in the dish and arrange the cherries. Dip few in the yoghurt. 16. You are ready to serve.